The Azatom brand is owned by a UK based Technology Company who specialise in developing sound performance systems for digital products. Azatom’s products has always been very competitive and successful as they focus mainly on one area which is sound quality. 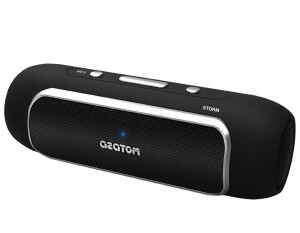 They have their own digital sound processing microchips which allows their products to produce superior sound quality, and the Azatom Storm Bluetooth Speaker is fortunate enough to be equipped with this. 24W/twin 52mm drivers and twin passive woofers produces a rich sound and powerful bass. Equipped with a digital sound processing (DSP) microchip ensures superior sound quality. Wireless range of up to 12 metres. Huge battery life up to 15 hours. Quick charge mode gives 5 hours of battery life from only a 1 hour charge. Able to stream music from services such as: iTunes, Spotify, Deezer, Last F.M, etc. Near field communication (NFC) technology means the Azatom Storm will automatically reconnect to the last connected device when it’s turned on. Compatible with virtually any Bluetooth device. 5mm port enables the speaker to be used with non-Bluetooth enabled devices. User friendly experience with voice status alerts. Built-in microphone allows you to take phone calls through the speaker. Speaker controls allow you to increase/decrease the volume, play/pause and answer phone calls. Powerful two XL 52mm drivers combined with a unique DSP delivers a rich, clear and loud sound with powerful bass performance makes it difficult for any other Bluetooth speaker on the market within the same price range to compete with. 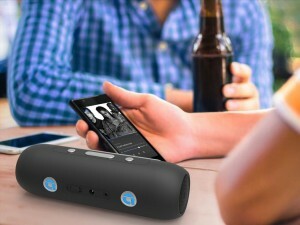 The wireless range is slightly more generous than most other Bluetooth speakers, allowing the speaker to stay connected to the paired device up to 12 metres. If your Azatom Storm is out of power and you need it urgently then quick charge mode gives 5 hours of battery life from just a 1 hour charge. The speaker is actually charged through the mains rather than USB, this means you haven’t got to buy a USB adapter if you don’t already own one or have to have your PC on just to charge your speaker. The controls on the speaker do not have a previous track or next track button. These are quite standard buttons that most Bluetooth speakers have so not sure why it’s not on a speaker as highly rated as the Azatom Storm. Charging time is said to be between 3-8 hours, bearing in mind this is charging through the mains so should be quicker than USB. Up to 8 hours seems quite long especially when you compare it to the August MS515 which has the same battery life but only takes up to 3.5 hours to fully charge. A powerful combination of the twin 52mm drivers, twin passive woofers and custom DSP microchip allows the Azatom Storm to produce high quality and rich sound with good bass. This speaker really does allow you to crank up the volume without having to compensate on sound quality. 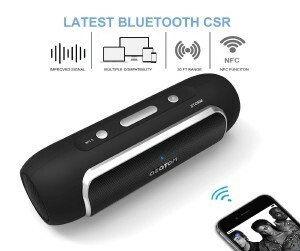 As mentioned not being able to select previous or next track on the speaker can be a bit inconvenient especially if you were playing music of your laptop, PC or TV as those devices are not as portable as your smartphone. This is not a deal breaker however as most people would probably use their Bluetooth speaker with their smartphone anyway. If you had to put a price tag on the Azatom Storm without knowing what it’s priced at, we would probably guess it’s priced between £50-£60.